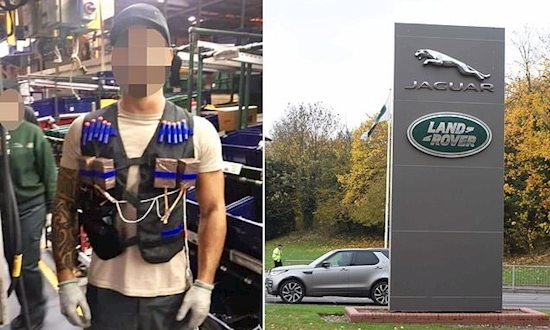 Jaguar Land Rover has suspended one of its workers for wearing a fake suicide vest to work and asking his colleagues if he should 'blow it up'. The smiling worker is pictured wearing the mock suicide belt at the UK car giant's Solihull plant in the West Midlands. Jaguar Land Rover says it is taking the incident 'extremely seriously' and has suspended the member of staff while it investigates. The shocking incident has emerged as the manufacturer prepares to cut 5,000 jobs in an austerity drive, including ones at its Solihull base. It is believed to have happened before Christmas last year, in an area known as 'zone five' where parts like wheels and bumpers are fixed to vehicles. 'I feel disgusted by this behaviour. This sort of stuff happens on a regular basis and a blind eye is turned to it. A Jaguar Land Rover spokesman said: 'We are taking this case extremely seriously, an investigation is already under way and the employee in question has been suspended. 'Jaguar Land Rover promotes diversity and inclusiveness to create a respectful workplace and adopts a zero tolerance to discrimination on any ground. Someone who works inside the Lode Lane plant but wished to remain anonymous said: 'Shop floor banter has got to this stage and it is a regular occurrence. 'I believe this to be the wrong attitude. If you don't deal with an issue then it will keep raising its ugly head. Today Jaguar Land Rover is announcing cuts to 10 per cent of its UK workforce - and blaming Brexit for its woes. The luxury carmaker employs 44,000 workers in the UK at sites in Halewood on Merseyside and Solihull, Castle Bromwich and Wolverhampton in the West Midlands. The thousands of jobs will be axed as part of a £2.5 billion savings plan amid falling sales in China and a drop in demand for diesel cars. The announcement is expected to include details of sales for 2018, the business outlook for this year, an update on cost savings and planned investment in UK plants.